Christmas Haul Time!! 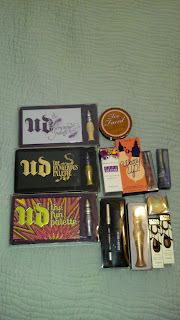 I have been trying out these awesome products so I can review them for you, my pretties. I will save myself the hassle of showing you up close and personal and swatching them right away, just to tell you I don't know how I feel about them. I am so excited to be trying some of these products out! Some of these I've been wanting to try out for months! I'm ultra excited about the palettes since they contain really beautiful shades.